Karen Kelsay's distinct poetic voice descends not from the modernists, but from the 19th-century "poetess" tradition that is being rediscovered by feminist scholars. Kelsay is the editor of Victorian Violet Press poetry journal, and like flowers pressed within the pages of a Victorian album, her poems translate memorable experiences into compressed visual images, and vice versa. Lush passages of description and hard-earned lines of wisdom lodge in the reader's mind. 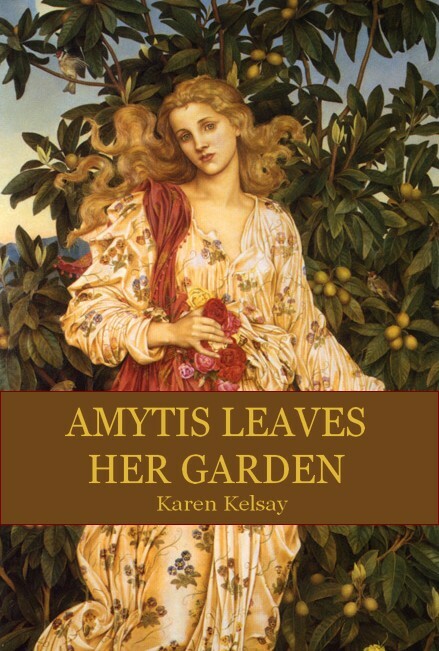 Studying this collection, “Amytis Leaves Her Garden,” I am captivated most by author Karen Kelsay’s confidence in her audience. Hers is a verse to respect the reader at every turn – beauty without blind, trap, or land-mine, as secure in itself as it is in its reader. “I read my thoughts on some far distant night…” she writes in the poem ‘Quiet Flame’ – an apt epithet for the collection – “…green willow trees with soft Parisian light.” And, seated in her audience, I feel as though not only is that light my own possession, but –“far and distant” – the thought, as well. Kelsay's ear has both melody & harmony enough to make her verse musical. Her exacting meters sing of courtship, couples growing old, evolving roles, but with a Symbolist air, with shades of Christina Rossetti, RenéeVivien & Stuart Merrill in her musing. Enter a world of colour and light in this book. In the marvellous poem ‘Chain Stitch’ colours gleam in reels of cotton thread. ‘Winter Needlepoint’ is a stunning earth-tapestry of berries, tree-trunks and darker tones. Some desolate poems, for example ‘A Beating Wing’, are resolved in happier poems such as ‘Sorrow’s Farewell’, ‘Acceptance’, ‘The Courtship Hour’, ‘Gathering Moss’ and ‘A Proper Man’. Karen Kelsay’s poems are feminine in the best sense of that word. The poet observes the comparative longevity of her aged parents in the funny and poignant ‘The Tortoise and the Hare’. ‘Drawing in the Sheets’ is beautiful in its honesty and strength. ‘Draining the Cup’ is quietly wise about the human life-cycle. The blank verse vignette ‘Superchild’ shows the unexpressed pain of childhood. Many of the poems cry out to be set to music by Robert Schumann. The controlled language is expressive and never stiff, the meter flowing and unobtrusive. The inhabited gardens of these poems have soil and wood as well as flowers. Transcendental illumination accommodates dark emotions, seasonal change, love and fulfillment. There is no escaping the word ‘beautiful any more than the words ‘honest’ and ‘strong’.